Located on the highly exclusive Upper Cheyne Row, known as Millionaires’ Row, this four-storey modern London home is now on the market for £22 million. Previously an architect’s studio, the incredible 7,000-sq-ft house has some very famous neighbours, including Dyson Founder and CEO James Dyson, The Rolling Stones bassist Bill Wyman and Mick Jagger. The street is also famous for once being home to former British spy, Greville Wynne, who met a prominent KGB General in his Upper Cheyne Row address, passing on information that averted war between the US and Russia over the Cuban Missile Crisis. Behind the minimalist front exterior lies an exceptional interior space, which comprises a breathtaking 2,000-sq-ft reception room with 4m high ceilings, floor-to-ceiling windows and large glazed sliding doors, plus five bedrooms including the master duplex suite, which leads onto a private study and roof terrace furnished with sun loungers and large sofa. Inside, there is also an open-plan kitchen/breakfast room, TV room, family room, and fantastic gymnasium and fitness studio with a mirror-lined wall, ballet bannister and high-tech gym equipment. The five-bedroom home sits on land once part of Our Most Holy Redeemer & St Thomas More Church, built in 1894, and incorporates part of the historic Grade II listed building into the property’s crisp modern design, using full-length glazed windows. The first floor is flooded with natural light due to the large artist’s studio like roof windows. To enjoy time outdoors, there are patio gardens, terraces and a courtyard. The home also has secure off-street parking for two cars. 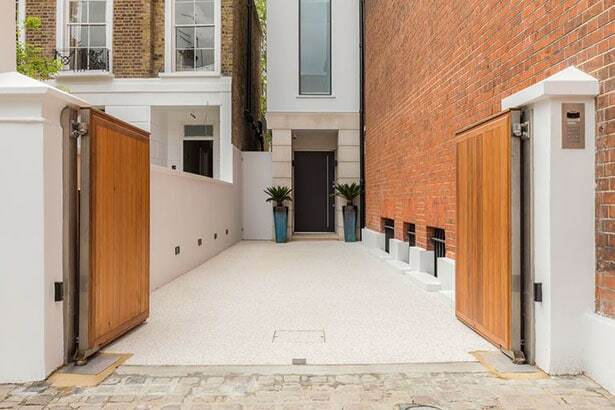 Jake Russell, director at Russell Simpson, said: ‘The discreet and unassuming entrance to this extraordinary home belies the truly spectacular space that exists beyond.